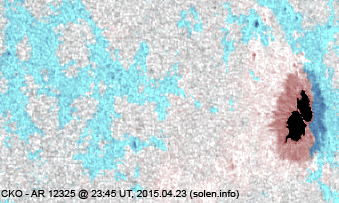 The geomagnetic field was quiet on April 24. 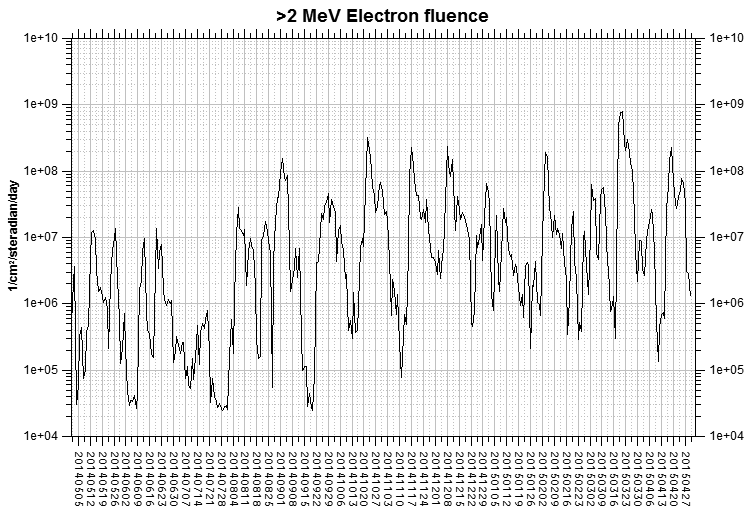 Solar wind speed at SOHO ranged between 348 and 449 km/s. 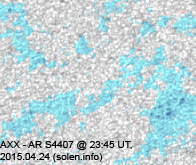 Solar flux at 20h UTC on 2.8 GHz was 134.5 (decreasing 11.1 over the last solar rotation). 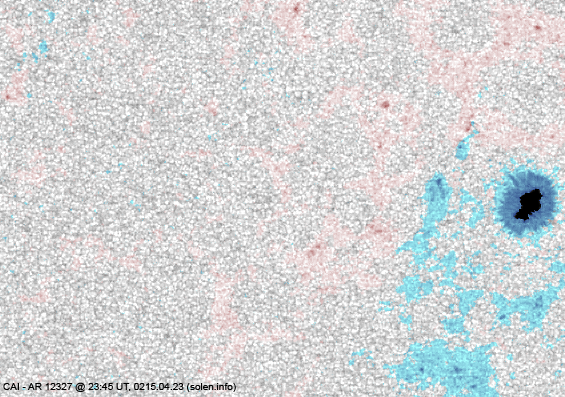 The 90 day 10.7 flux at 1 AU was 129.4. 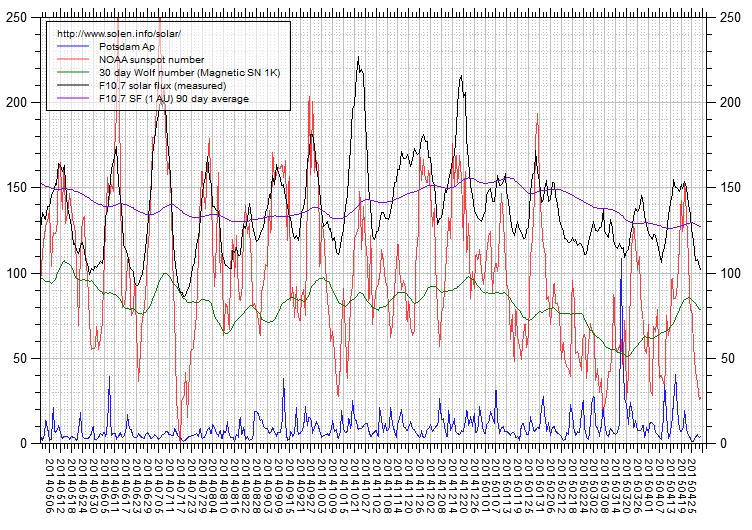 The Potsdam WDC planetary A index was 3 (STAR Ap - based on the mean of three hour interval ap indices: 3.4). 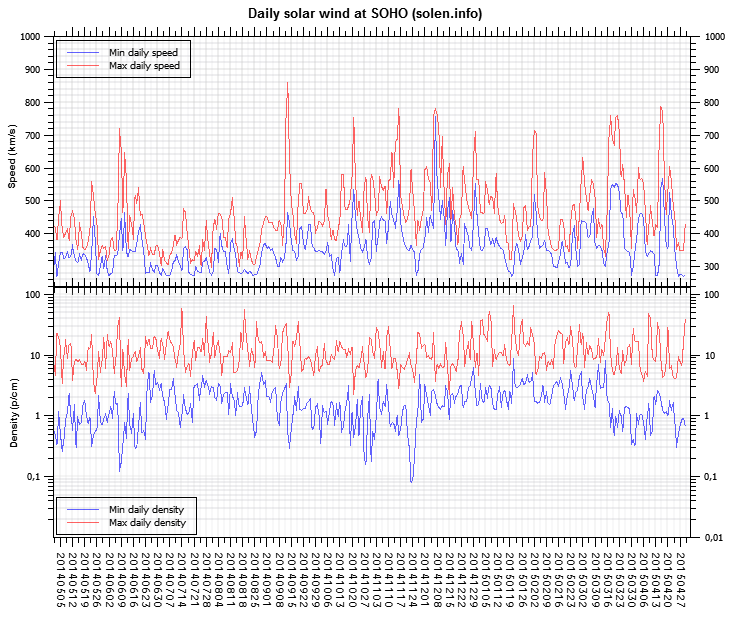 Three hour interval K indices: 22010000 (planetary), 23011211 (Boulder). 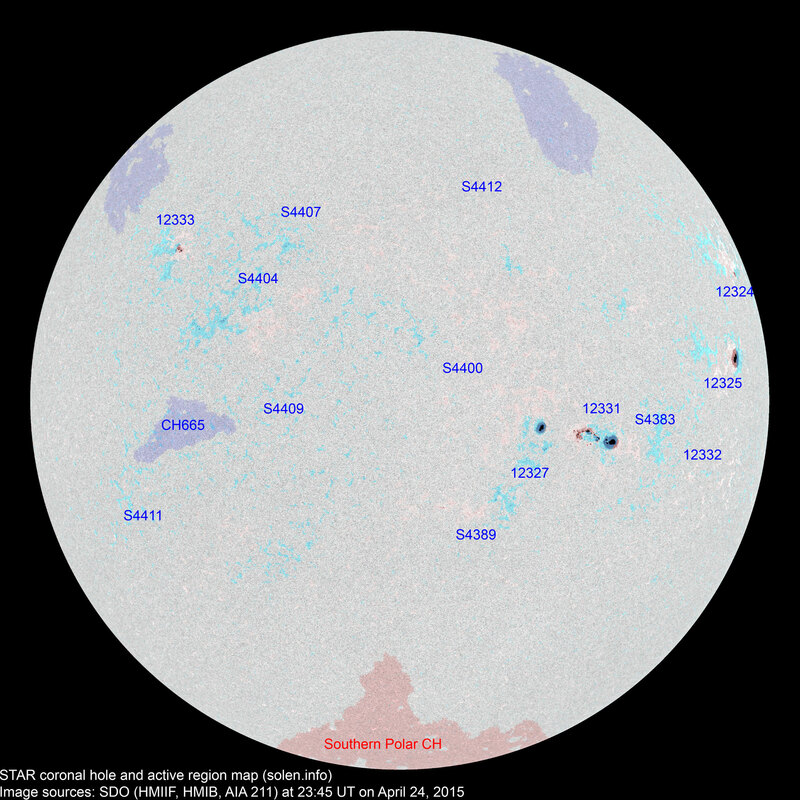 At the time of counting spots (see image time), spots were observed in 14 active regions using 2K resolution (SN: 236) and 9 active regions using 1K resolution (SN: 132) SDO images on the visible solar disk. Region 12324 [N18W73] decayed slowly and quietly. Region 12325 [N04W66] decayed slowly and quietly. Region 12327 [S09W22] decayed slowly and quietly. 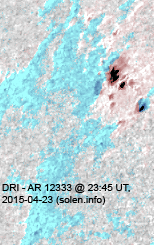 Region 12331 [S10W33] developed as new flux emerged in the trailing and intermediate spot section. A weak magnetic delta formed in a small central penumbra. 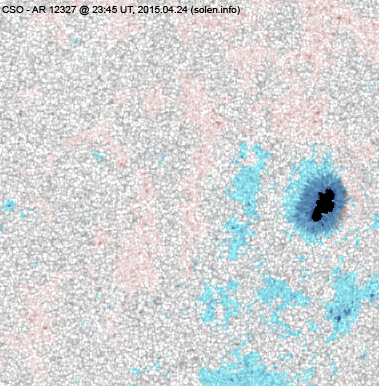 The region produced several low level C flares and may be capable of producing a minor M class flare. 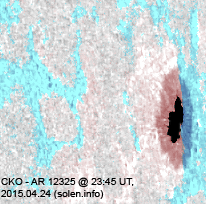 Region 12332 [S15W54] reemerged with a penumbra spot. Region 12333 [N20E39] decayed slowly and was mostly quiet. S4383 [S12W41] was quiet and stable. 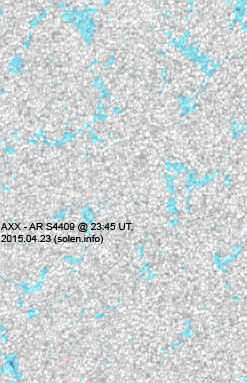 S4389 [S21W12] reemerged with penumbra spots. S4400 [N06W12] was quiet and stable. S4404 [N08E27] was quiet and stable. S4407 [N19E19] was quiet and stable. S4409 [S01E18] was quiet and stable. 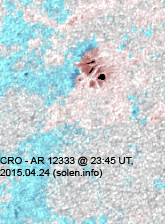 New region S4411 [S17E47] emerged with a penumbra spot. 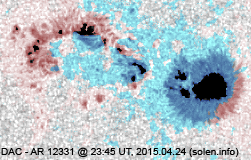 New region S4412 [N27W15] emerged with a penumbra spot. 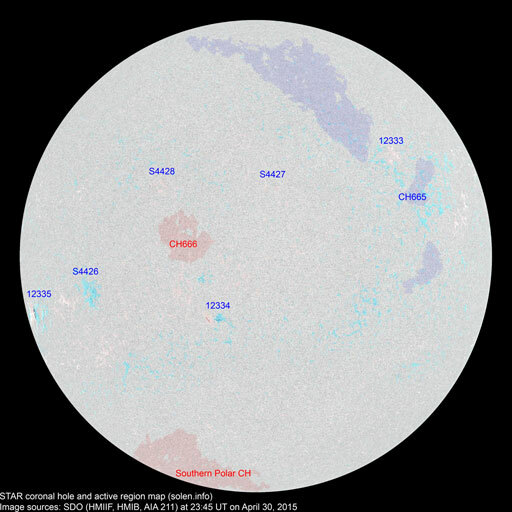 A filament eruption in the southeastern quadrant was observed early on April 25, it is not yet known if there was a CME. 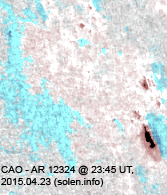 A large filament has rotated into view in the northeast quadrant and appears to be somewhat unstable. 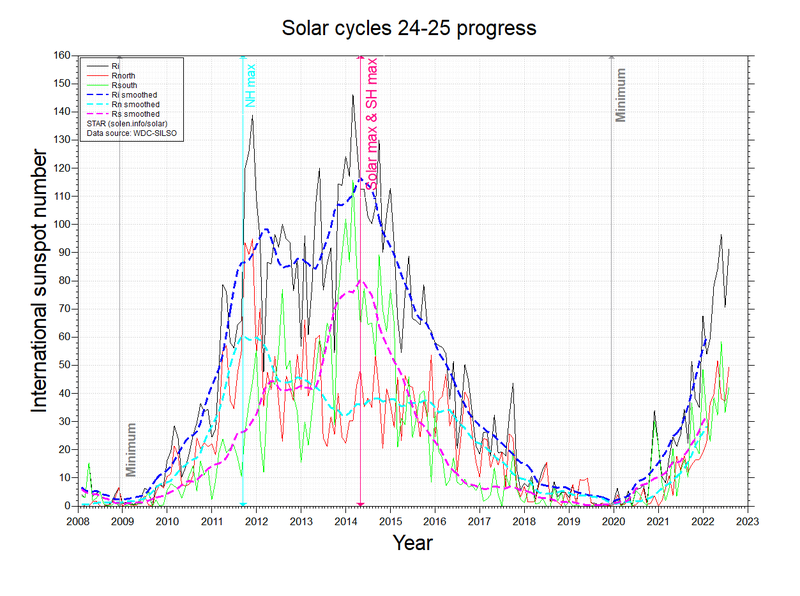 April 22-24: No obviously Earth directed CMEs were observed. 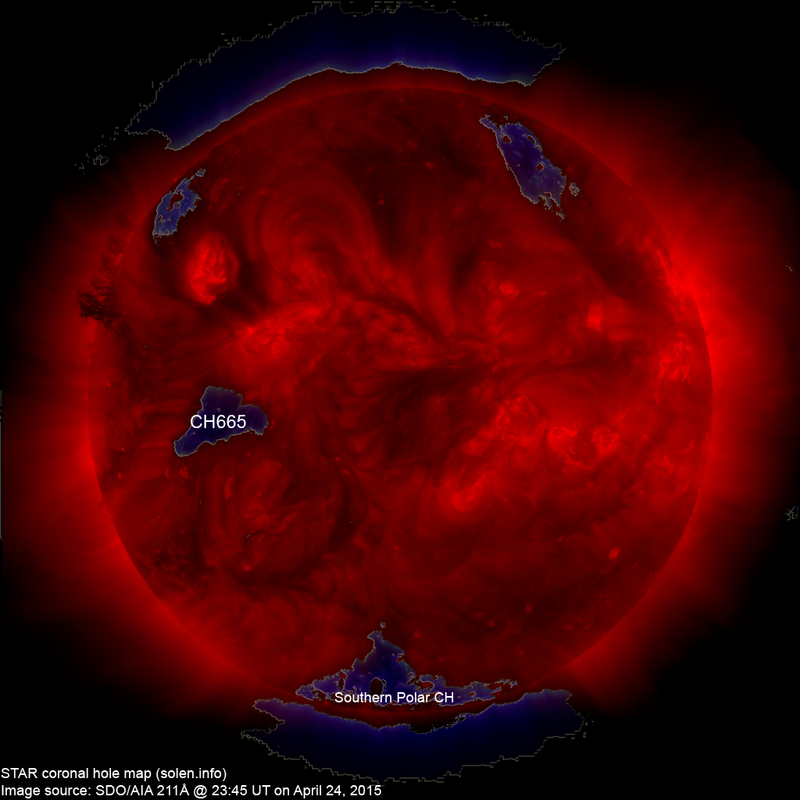 The geomagnetic field is expected to be mostly quiet on April 25-28. 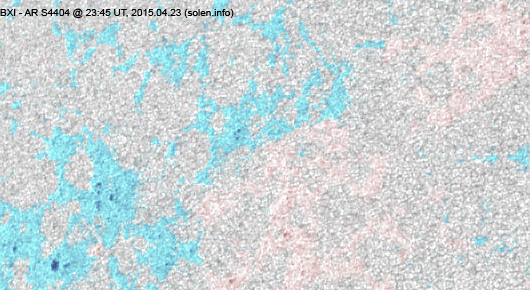 Effects from CH665 could cause some unsettled and active intervals on April 29-30.